* Ymir's blood has bronchitis and you don't. Deal. Deal! You get the bronchitis, while I get this lovely patio furniture! Done! You get the lovely patio furniture, while I get these lovely handcrafted MLP-inspired rubber band bracelets from The Big One. It's actually Mare of the Moon by Rainbow Honey. 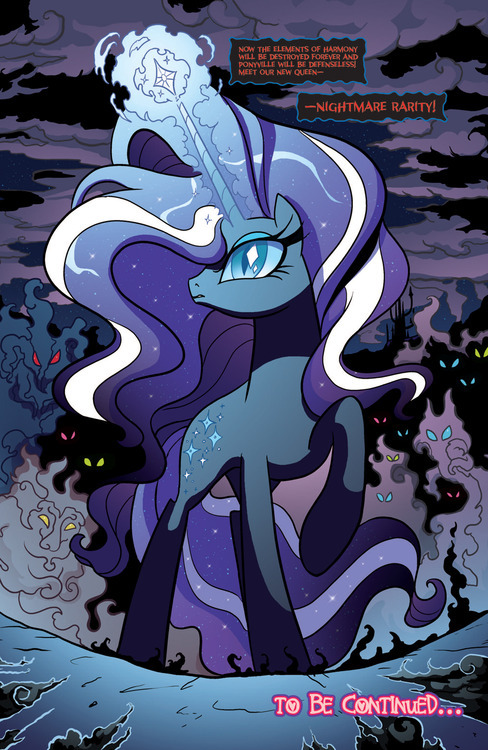 Because when Rarity isn't around....Luna is best pony. Those would be excellent Secret Santa gifts, does The Big One have a storefront? She's taking orders, but she's already falling behind. I'm having her make one for each of The Four Nations next. Bort. I really need to start reading that comic. That image is beautiful. Take it to the Brony thrad, Bronys or whatever you're called. I just got my latest shipment of English Bacon delivered yesterday. I will not be benedicting any of it. It will mostly go for full Englishes on Sunday mornings, though a batch of breakfast risotto may be in my future. I am interested in this breakfast risotto of which you speak. Moar details please. I don't know if I wrote it up elsewhere here, but here goes. I slice bacon into lardons, American will work but English is better. I fry them up nice and crispy in my risotto pan, then scoop them out leaving the grease. I add olive oil to the grease and make my regular version of sun-dried tomato risotto. I use the tomatoes that have to be reconstituted in water, then add the water from the tomatoes to chicken stock for the risotto. When the risotto is cooked I add parmesan and the lardons into it. I serve it with a poached egg and another piece of English bacon on top. Here's a picture of a version made with inferior American bacon because I was out of the good stuff. It managed to evade the dogs there, but not the slightly more intelligent human. When I'm home in the evening, with the living-room lights on, lots of moths and other night-flying insects are attracted to the light. Consequently, there are typically lots of moths on the window screen, trying to get inside. Several of the local Gray Tree Frogs (Hyla versicolor) have discovered the feast, and so most nights, there will be a frog or two sitting on the window frame, snatching unwary insects. Some nights, there can be as many as five of them present. One of them has grown remarkably fat on his steady diet of moths. I find them quite charming. On a vaguely-related note, a nearby nature center has a small artificial pond with some Daylilies (Hemerocallis fulva in a planter right in the center of the pond. Last weekend, as I was wandering past the pond, I noticed a Green Frog (Rana (Lithobates) clamitans) perched on a daylily leaf, about a foot above the water. Since this species doesn't have adhesive toe pads like tree frogs do, how the frog managed to climb to its perch I have no idea. 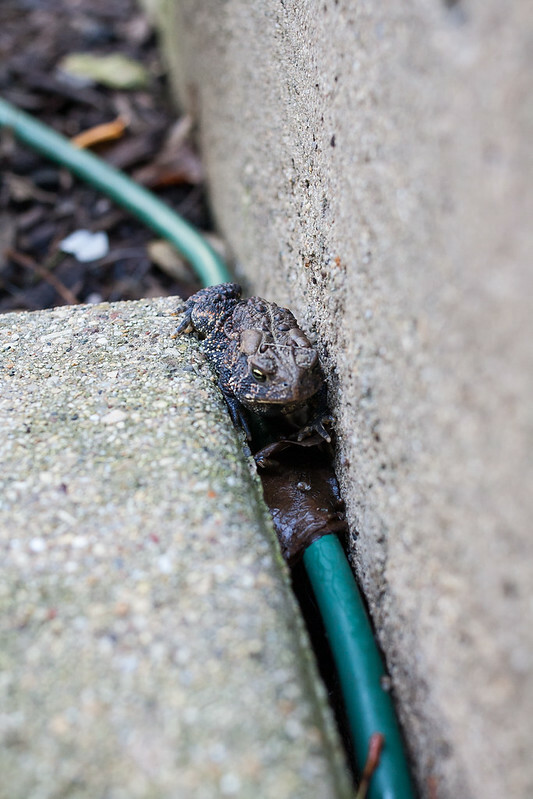 Nonetheless, the frog seemed quite comfortable with its relatively lofty perch. "No one told us that there would be so many foreigners."